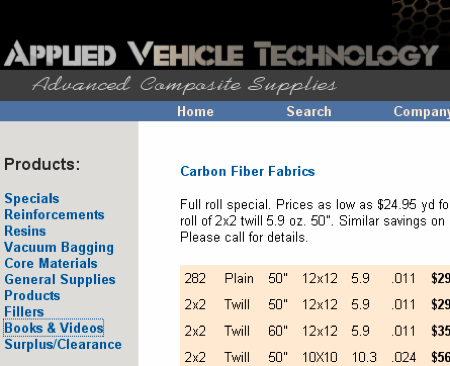 Currently viewing the tag: "fiber"
Carbon fiber is quickly making its way into everyday devices, thanks to widespread research into industrialized production and cost reduction. 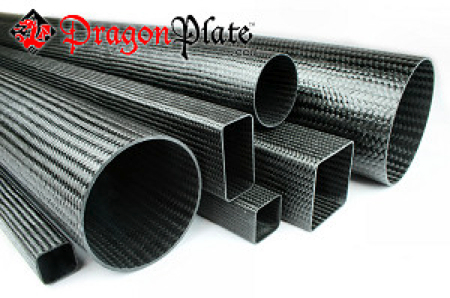 Universities and companies the world over are throwing incredible amounts of money and effort at turning this modern wonder into a commonplace material, and retailers like Dragon Plate are making carbon fiber available to the masses. While it’s tricky to work with, carbon’s light weight and high rigidity make it ideal for a wide variety of applications. Dragon Plate retails carbon sheets, veneers, tubes, rods, angles, channels, and even some swanky flame-retardant PRC. Of course, this stuff isn’t exactly cheap. A 6″ x 6″ sheet of their cheapest 1/16″-thick “Economy Plate” costs $23.25, and prices go from there… well, into space. A 48″ x 96″ sheet of their flame-retardant plate costs $1,515, and that’s only 0.025″ thick. Making your own composites is certainly cheaper, but if you run across a small-scale problem carbon fiber can solve, Dragon Plate could be a silver bullet. Wayne State University’s Warrior Racing recently needed to machine a sheet of Nomex-honeycomb carbon fiber, a piece of a scratch-built custom steering wheel. It’s a bit of a challenge machining the stuff since it’s an extremely hard fiber suspended in a soft synthetic. After a few experiments, we ran everything at very low feed rates and ridiculous spindle speeds, which is a bit contrary to popular wisdom when machining hard materials. 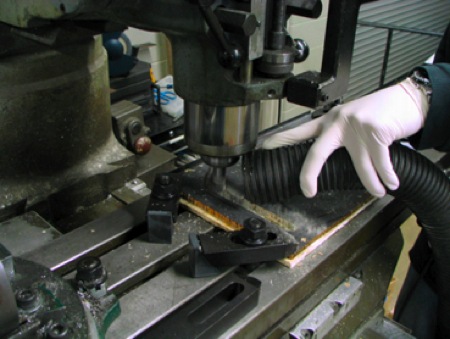 Carbide is the cutter of choice, in the four-flute flavor, just like machining steel. The same goes for feed rates — right around 2.4 inches per minute seemed to be a sweet spot with a 5/8 in. end mill and maxed-out 3000 RPM spindle speed. Without a CNC system, the feed rate will be hard to match precisely, and there aren’t any chips whose colors can tell you to speed up or slow down. Speaking of chips, the leftovers from machining carbon are nasty. Fiberglass and carbon weave are nasty enough, but this stuff is coated in epoxy and comes off in unbelievably thin spear-like flakes. The latex gloves the machinists wear are a must, as is a respirator and a vacuum to remove as much dust and as many flakes as possible. Even so, I managed to get a few wicked splinters when cleaning up the part edges. Oh — wash your hands before you use the bathroom afterward.